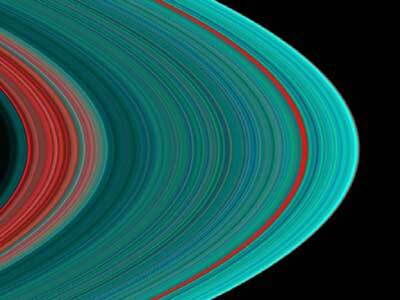 Saturn's Rings Ultraviolet - Universe Galaxies And Stars Section. Saturn's rings in the ultraviolet. The best view ever of Saturn's rings in the ultraviolet indicates there is more ice toward the outer part of the rings, hinting at ring origin and evolution, say two University of Colorado at Boulder researchers involved in the Cassini mission. Researchers from CU-Boulder's Laboratory for Atmospheric and Space Physics, Joshua Colwell and Larry Esposito, said the UV spectra taken during the Cassini spacecraft's orbital insertion June 30 show definite compositional variation in the A, B and C rings. Esposito, who discovered the F ring around Saturn in 1979 using Pioneer 11 data, is the team leader for Cassini's Ultraviolet Imaging Spectrograph, or UVIS, a $12.5 million instrument riding on the spacecraft. A UVIS team member and ring expert, Colwell created the color-enhanced images from the spectra. The CU-Boulder built UVIS instrument is capable of resolving the rings to show features up to 60 miles across, roughly 10 times the resolution obtained by the Voyager 2 spacecraft. The instrument was able to resolve the "Cassini division," discovered by Giovanni Domenico Cassini in the 17th century, which separates the A and B rings of Saturn, proving the rings are not one contiguous feature. The ring system begins from the inside out with the D, C, B and A rings followed by the F, G and E rings. The red in both images indicates sparser ringlets likely made of "dirty," and possibly smaller, particles than in the denser, icier turquoise ringlets.